Ctrl+Enter will now serve as a way to enter the project view of the item under cursor. This works for both sub-items and parent items. The top-most sequential project action will now appear separated from the rest. The ability to complete checklist items on template actions was confusing to many users. Most of the time we want to work with checklists on repeated actions, not templates, so having the clickable checkboxes there doesn't make sense. Notice the item at the top is a template, and the item at the bottom is the actual repeating item. The application will no longer fail silently in case of a user interface error. 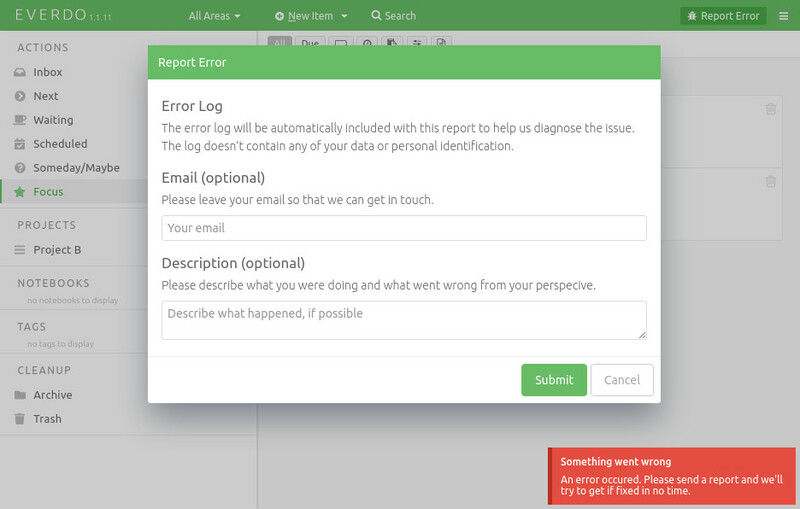 You can now report an error easily using a form. The report button only appears after an error.